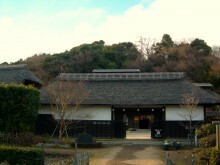 Yokomizo Yashiki, now a designated Yokohama cultural property, is a complex of farm buildings from the early to mid nineteenth century. 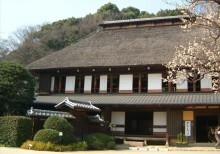 The Yokomizo family were the headmen of their village and had a very substantial property, which their heirs donated to Yokohama. The city has restored the five surviving buildings—the gate (with built-in storerooms, shown here), the handsome main house, a separate building for raising silkworms, a granary, and a document storehouse—and opened them to the public as a park/history museum. The interior is preserved to show what farm life (farm life on the high end of the scale, to be sure) was like in the past. In addition to touring the main building, Yokohama residents are welcome to rent its sitting room for events. 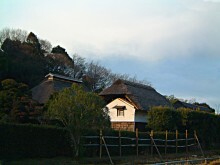 Thatched-roof buildings such as these are rapidly disappearing from Japan. It’s rather amazing to have such a fine set of them preserved in Yokohama, which is so identified with modernity and where what was countryside a century ago has been so rapidly urbanized.